I got some numbers for you. 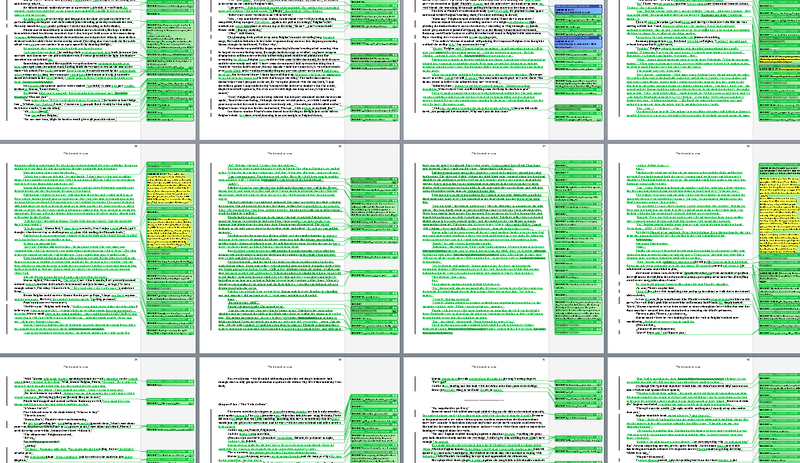 Look at all those revisions!!! Just to be clear, this is not the end of the editing process. It’s back with the Editor / Head of Story at Inkshares, Matt Harry, who’ll look over the changes and make further suggestions. (Hopefully I cleared the higher hurdles the first time around the track and the next lap is easier.) From there, somebody’s gotta clean up my terrible, awful, hideous, redundant word choice… Cover design conversations with the artist… Where is this all going, you ask?! Well, it means it will still be a wait. I’m keeping my fingers crossed for a 2018 release, but I can’t say for sure. In the meantime, I literally don’t know what to do with myself any more. If I’m not working on something, I’m getting ANTSY. While I wait for the Inkshares wheel to turn another notch in Animal in Man’s production track, I’ll be putting more words down for my next novel “The White Shadow”, which you can read the first few chapters of HERE. (I added a chapter to my website since the previous time posting about it, and I’m eleven chapters beyond that point in the writing.) I might even be putting up an Inkshares draft page for the book soon. Who knows. To all of my supporters, all of you who’ve hung in there this long and longer: Thank you.